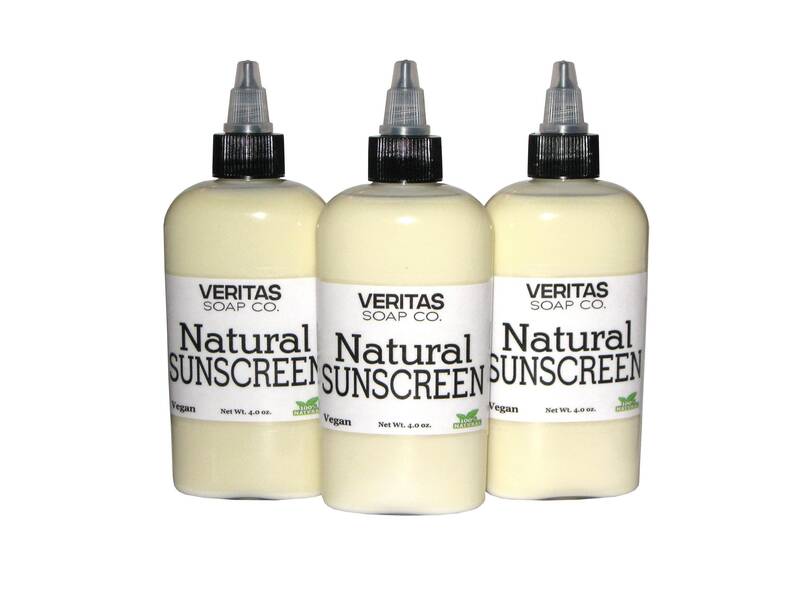 Veritas Soap Co's Sunscreen has a Broad spectrum protection from UVA & UVB rays and is formulated with beneficial ingredients such as Organic Coconut Oil (Natural SPF of about 10), Organic Olive Oil, Organic Jojoba Oil, Rice Bran Oil and Organic Red Raspberry Seed Oil (which has a natural SPF of about 40-50). Most Sunscreens on the market have toxic ingredients and according to a 2014 Environmental Working Group study, research suggests that oxybenzone and other sunscreen chemicals can be toxic to reproductive systems and/or interfere with normal cell development. The lovely state of Hawaii is also working to pass legislation on banning Sunscreens with Oxybenzone and Octinoxate because of the damage it is doing to our coral reefs worldwide. 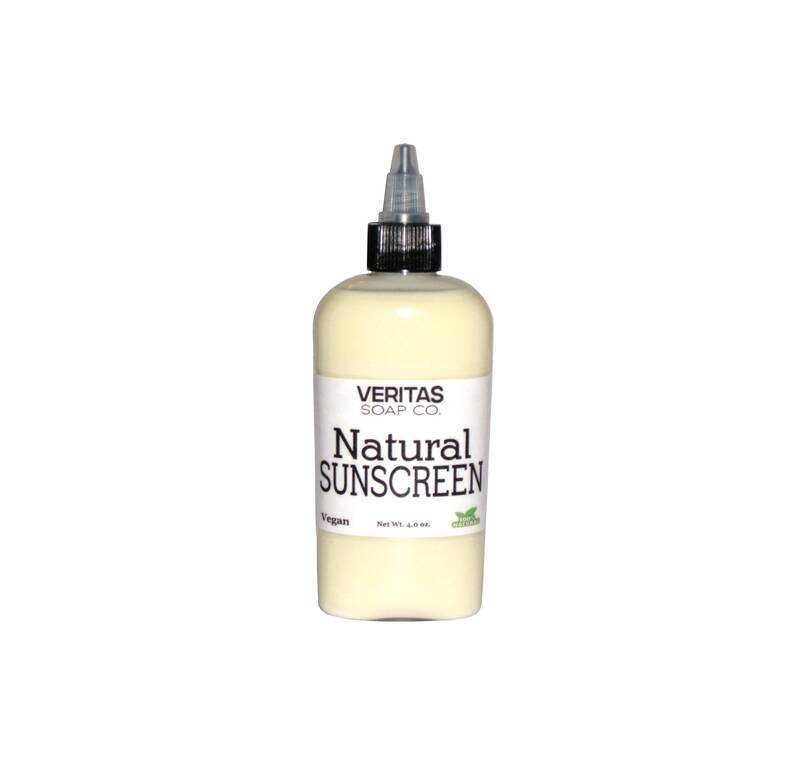 Use natural Sunscreen for your family AND the environment! 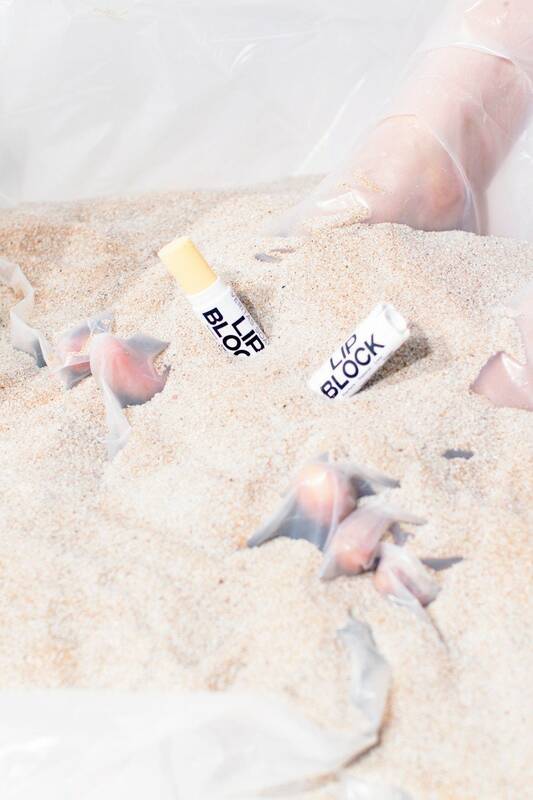 Looking for a Natural Sunscreen for your Lips --> try our NEW LIP BLOCK! 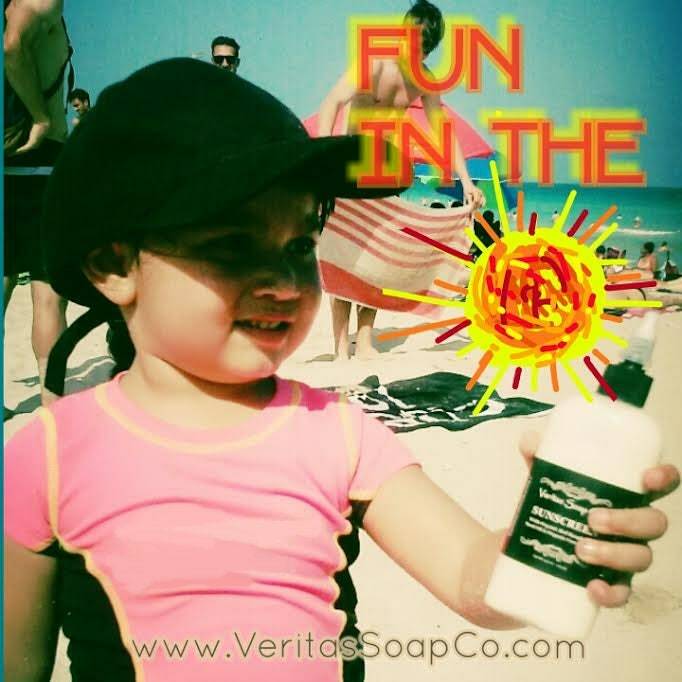 Veritas Soap Co. only uses the safest ingredients to block the sun and protect your skin! *This is a natural product, we do not use any silicones, phthalates or liquid polymers of any kind to keep the zinc suspended, please SHAKE WELL before each use. Please re-apply as often as necessary! Keep an eye on children and babies (also use hats that cover the neck & long sleeves in the hot summer months!) Remember, the point in using Sunscreen is to NOT GET BURNED... Keeping the white on keeps the burn away!! Ingredients: Organic Rice Bran Oil, Organic Coconut Oil, Organic Olive Oil, Organic Red Raspberry Seed Oil, Organic Jojoba Oil, Organic Arrowroot Powder, Non-nano Zinc Oxide, Vitamin E Oil (Tocopherol), & Candelilla Wax. This product is not rated by the FDA. Yes, we offer wholesale! Contact us to inquire about a pricing quote! Its natural and did not burn my eyes. Hard to get out of the bottle. Wonderful! It works very well, and I feel great putting it on!